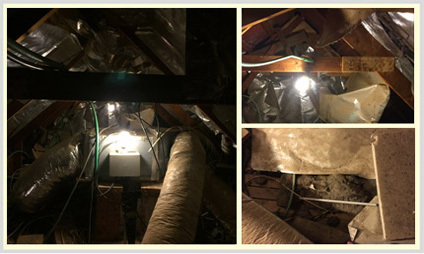 The crawl space in your home is a breeding ground for a host of potential problems that could cost you money and affect the health and safety of your family or residents. The primary cause of these problems is excessive moisture, coming from the bareground, and also forms as condensation around pipes and ducts. Moisture promotes fungal growth (rot) and draw out salts in wood and concrete (efflorescence) which, over time, can corrode the foundation, floor joints, wood flooring and walls. When left unchecked, these issues can run thousands of dollars in repair and restoration. Vapor barriers consist of layers of thick plastic sheets placed on top of the soil and rock floor of the crawlspace. The sheets are attached to the inside edges of the foundation walls with strong adhesive duct tape and weighted down with a line of soil. Vapor barriers will help seal in any moisture that rises to the surface, and would normally accumulate in puddles. Now that there is a barrier in place, it’s time to survey the damage that may have already been caused by moisture. Protected by safety goggles and a face mask, workers go inch-by-inch inspecting surfaces, and use a wire brush and a putty knife or paint scraper to remove the offensive materials. The process takes time and patience, but is well worth the effort. This is also the time to decide whether damage from rot, efflorescence, mold and termites warrants doing more extensive repairs. Once the area has been repaired and stabilized, it is best to keep the crawl space and framing as dry as possible. A new ventilation system may be needed , and it is important to ensure that the pipes are wrapped with insulation. It may be necessary to coat any exposed wooden surfaces with a special preservative containing a pesticide, like copper or zinc napthenate. Special caution and preparation must be taken with these potentially harmful and highly odorous substances. Finishing the crawl space in this manner will help prolong the life of your home or business, and potentially save you money over the long haul. Want to hire a professional team to handle your crawl space improvements? Quartz Solutions has extensive experience in vapor barrier installation, and is licensed and insured. We are also passionate about improving your attic and crawl space, offering quick response times and the highest quality work. contact our office today at 201-205-2042, 973-536-1013 to schedule your free inspection.